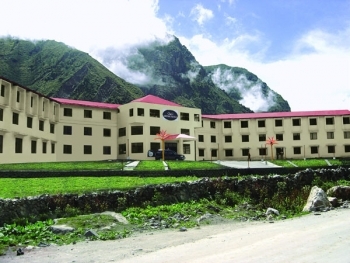 Hotel Sarovar Portico is situated in the town of Badrinath at an elevation of 3,133mts above sea level. It is situated just 0.5 Km away from the sacred Badrinath Dham and the bank. Cafe in the Park at Sarovar Portico serves a wide range of multi-cuisine dishes. Owing to the religious sanctity attached to the place, the café serves only pure vegetarian delicacies. Sarovar - The Fast Food Restaurant is also the main attraction of the hotel. It serves like a food court, the place has some mouth watering Indian fare. By Air: Jolly Grant Airport is the nearest Airport to Badrinath situated at a distance of 314kms. Jolly Grant Airport is well connected to Delhi with daily flights. Badrinath is well connected by motorable roads with Jolly Grant Airport. Taxis are available from Jolly Grant Airport to Badrinath. By Rail: The nearest railway station to Badrinath is Rishikesh. Rishikesh railway station is situated 295kms before Badrinath on NH58. Rishikesh is well connected by railway networks with major destinations of India. Trains to Rishikesh are frequent. Badrinath is well connected by motorable roads with Rishikesh. Taxis and buses are available from Rishikesh, Srinagar, Rudraprayag, Chamoli, Joshimath and many other destinations to Badrinath. By Road: Badrinath is well connected by motorable roads with major destinations of Uttarakhand state. Buses to Haridwar, Rishikesh and Srinagar are available from ISBT Kashmiri Gate. Buses and Taxis to Badrinath are easily available from major destinations of Uttarakhand state like Rishikesh, Pauri, Rudraprayag, Karnaprayag, Ukhimath, Srinagar, Chamoli etc. Badrinath is connected with Ghaziabad by National Highway 58.